Well, that’s not a very spectacular headline. I mean, sands shift all the time. Wind blows it. Surf moves it. Rain causes river levels to change which can cause the river’s path to change. But it still amazes me how fast it can happen. There has been a major change in direction at Big Creek over the last week. Ok, since there are so many creeks by the same name, this is the Big Creek between Beachside State Park and Tillicum Beach Campground on the Oregon coast. We noticed the change when we crossed the bridge. You used to see it go almost straight out to the ocean from the bridge. Now it curves directly to the south and disappears. So I had to take a look from the beach today. Sure enough, it wraps around the curve of the land. If the rip-rap weren’t there, a property-owner would have lost real estate! 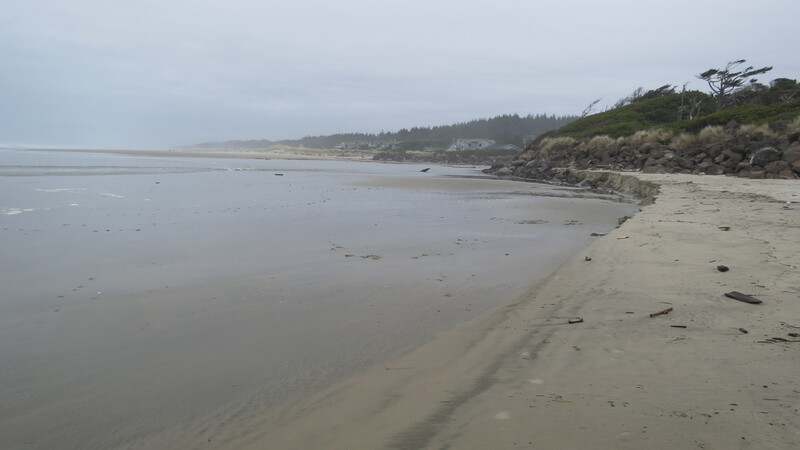 The ocean moved so much sand onto the beach that it caused the river to find a different pathway. So it moved south about 100 yards. The north side of the creek gained that much beach; in front of Arnold’s Beach Haven – Sandy Shores…to put in a plug for a friend. 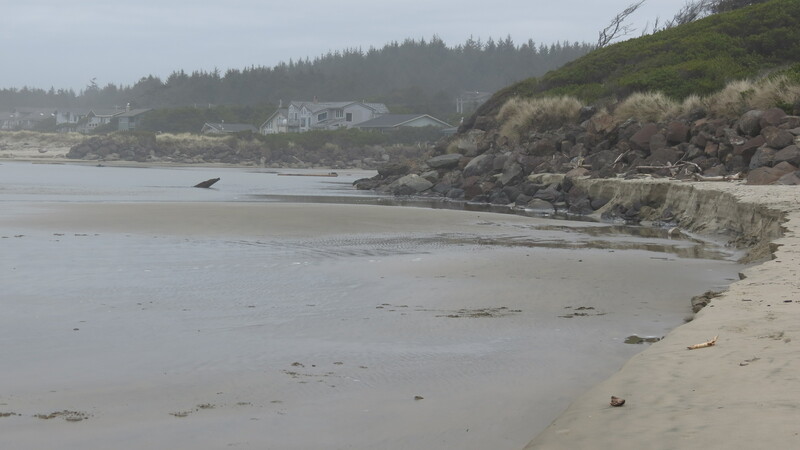 Mind you there’s 8 miles of sandy beach between Waldport and Yachats and, to my knowledge, this is the only creek you’d have to ford to cover it all. Tillicum Beach Campground sits midway. So now if you need a longer walk from the campground, walk south. High tide was 8.8 today and we’ve had slightly minus tides. But I think it’s the storms that do more to move the sand than the tides do?